Recently, I posed a question about the best language learning strategies on Facebook. I also posted it on Twitter, but I guess I haven't figured the twitter system out yet, because no one responded! As you can guess, the responses generally centered around interaction with native speakers or target language native speaker materials (like television or music). Naturally so—people who have learned a foreign language agree that native speaker interaction is practically irreplaceable. 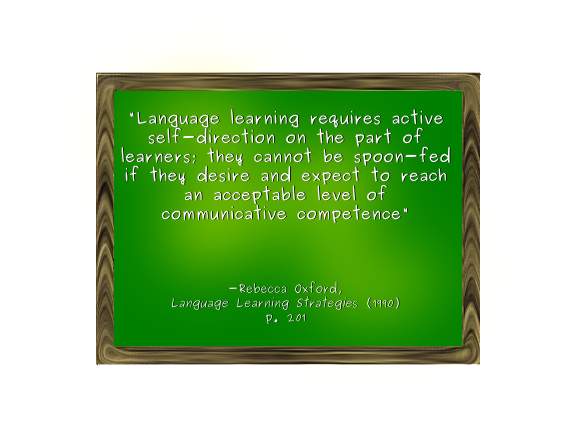 In fact, studies have shown that learning a native language in a context-rich environment (i.e., English as a Second Language) instead of a context-poor environment (i.e., English as a Foreign Language) can shorten the time it takes to become proficient by years. I will be one of the first ones to jump on the “practice-with-a-native-speaker suggestion” bandwagon; however, I think that we focus on native speaker interaction at the expense of developing other language learning strategies that can make those interactions more salient and that can help even when native speakers or materials are not available. A prime example is time spent in the classroom. When people suggest interaction with a native speaker as a language learning strategy, they are primarily referring to some sort of effort at independent learning. Few EFL teachers have the ability to pair their students with native speakers during classroom instruction time. Even if they did, it would be difficult to incorporate that activity with the other language instruction needed to keep all students at a semi-uniform level of learning. This is where the value of incorporating language learning strategy training in teaching comes in. By arranging lesson plans and learning environments that introduce strategies and help students practice them, a teacher can prepare students for more successful independent learning. In order to help myself (and anyone else) understand these strategies better, I will be doing a series of blog entries covering the main language learning strategies, discussing the research, and providing tips for incorporating them in the classroom. I have a list of valuable resources for learning and teaching English (ESL/EFL) that may be of interest to you as you may be looking for new interesting helpful information in this regard. I may have something really valuable to you! I'm a former ESL teacher. I've finished my ESL teaching activity and I no longer teach English. But I want to provide teachers and learners of languages with my valuable resources as I do not need them much. My articles are suitable for learning many languages. You may be interested in particular in my comprehensive plan for mastering a language on one's own. I believe that some of my suggestions can contribute to improving your own tips. I learn from tips of other authors as well. Exchange of information (thoughts, views, etc) is beneficial. I've explored many language learning and teaching websites, including those with unconventional advice. I've got interested in language learning strategies and in issues of how to become a better language learner. This is important for easier, more productive, quicker, more enjoyable and more successful language learning. I've searched for information on these issues. I've selected the most important links in my opinion.